Proposal for period beginning March 2012, ending February 2013. Seedlings were transplanted in a sandy loam type soil on 22-23 May at the University of California’s South Coast Research and Extension Center. Experimental plots were 3 rows wide (5-ft centers) by 40 ft long and separated by a 3-ft buffer. The pepper transplants were drip irrigated (water pH 7.2 - 7.5). Treatments were replicated 4 times in a RCB block design. Application dates and a treatment list are shown in Table 1. All applications were made at twilight. A tractor-mounted boom sprayer with 6 nozzles per row incorporated D-3 orifice disks, #25 cores, and 50 mesh screens. Operating pressure was 125 psi delivering 100 gpa. All treatments except Rimon included Dyne-amic as an adjuvant at 0.25% vol/vol. On 4-5 Sep, 100 mature-green to ripe fruit were harvested from the center row of each replicate (400 per treatment) and examined for Lepidopterous internal damage TFW, external damage BAW, and hemipterous pests SB. One hundred fruit were also inspected for damage from pepper weevils PW. Results are shown in Table 2. Lepidopteran pressure was estimated to be moderate in the categories of External damage by BAW (Figure 4). There were no significant differences between any treatments for Lepidopterous insect damage. Internal damage by PW was high this year with the control sustaining 19% damage (Figure 2). We did see some differences between treatments for potato psyllid PP numbers (Figure 1). Treatments 6 and 14 had higher psyllid numbers. Damage to the calyx showed no statistical differences between treatments and can be attributed to TFW, BAW, and PW feeding (Figure 3). Leafminer populations were low, and no statistical separation was possible on any sample dates. The results of dead adult parasites were not included this year due to low numbers. No phytotoxicity was observed in any of the treatments. Seedlings were transplanted in a sandy loam type soil on 23-24 May June at the University of California’s South Coast Research and Extension Center. Experimental plots were 3 rows wide (5-ft centers) by 40 ft long and separated by a 5-ft buffer. The pepper transplants were drip irrigated (water pH 7.2 - 7.5). Treatments were replicated 4 times in a RCB block design. This year the IPM program was incorporated into the chemical screening trial. Treatment 1 was the control and treatment 15 was an IPM rotation. Treatment 14 was a chemical standard. Applications were made as specified in (Table 1). All applications were made at twilight. A tractor-mounted boom sprayer with 6 nozzles per row incorporated D-3 orifice disks, #25 cores, and 50 mesh screens. Operating pressure was 125 psi delivering 100 gpa. All treatments included Dyne-amic as an adjuvant at 0.25% v/v. On (23 August), all of the mature-green to ripe fruit were harvested from the center row of each replicate. The number and weight of the fruit were recorded for harvest yield data. From each replicate 100 fruit were sub-sampled (400 per treatment) and examined for Lepidopterous internal damage (tomato fruitworm) and external damage (beet armyworm)(Figure 4). Fruit were also inspected for damage to the calyx, and from pepper weevils (Figure 3), hemipterous pests and presence of psyllids (Figure 1). The results for insect damage are summarized in (Table 2). Lepidopteran pressure was low to moderate in the categories of external damage by beet armyworm and no differences were seen. Internal damage from tomato fruitworm was low this year. Internal damage by pepper weevil was high this year. There were moderate levels of damage to the calyx but there were no differences between the treatments. No phytotoxicity was observed in any of the treatments. We did not see a significant difference between the chemical standard and IPM rotations for the infestation levels of psyllids. There was a slight increase in psyllid numbers for treatment 14 which is a chemical standard treatment. This treatment used carbamates and pyrethrins which can kill beneficial insects and actually cause an increase in the numbers of psyllids. We have seen this scenario occur in our previous chemical standard trials. Potato psyllids vector the bacteria Candidatus Liberibacter psyllaurous (solanacearum). However, unlike tomato and potato, bell peppers (Capsicum annum L.) do not exhibit symptoms from infection. Instead most damage is caused by mold, directly from feeding, or from honeydew residue on plant tissue. Potato psyllids show variation in spatial patterns and host choice with cultivars and plant species. 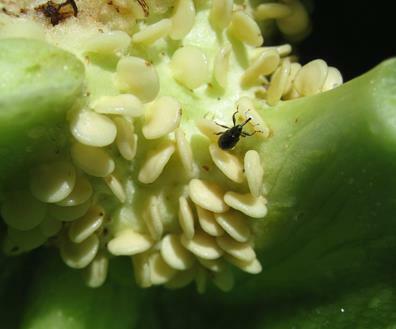 Consequently, a study of spatial distribution and sampling plan specific to bell peppers is necessary for management of this insect pest. Sampling was conducted biweekly in 2009 and 2010. In 2009, samples were initiated with the appearance of psyllids beginning in July, while 2010 sampling began in May; final samples were collected in November of both years. A total of three field sites were sampled. In both 2009 and 2010, 0.2 ha plots of variety ‘Baron’ at the University of California’s South Coast Research and Extension Center in Orange County (Irvine, CA) were sampled using a stratified random design. Additionally, commercial fields were sampled in Ventura County California each year. 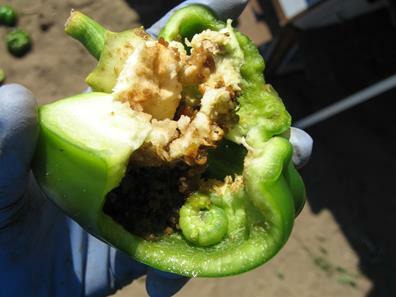 In 2009, 0.02 ha plots of organically-grown bell peppers (variety ‘Islander’) were sampled. 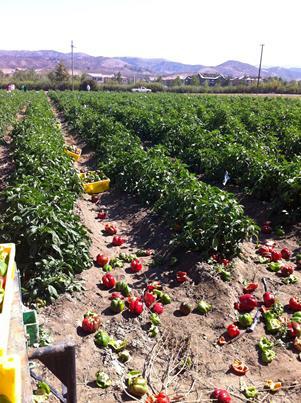 In 2010, a 60 ha commercial bell pepper field (variety ‘Crusader’) was sampled. Fields in Ventura County were sampled using a systematic sampling design. In all sites, a minimum of 8 and maximum of 18 entire plants (all leaves, stems and fruit) were sampled on each sampling date. Potato psyllids were evenly distributed on both sides of leaves (TTEST: T=0.595, DF=1109, P=0.55) (Fig. 5). While some changes occurred over time, nymphs were consistently located in the top and middle of plants versus the bottom (Fig. 6). Within fields, psyllids demonstrated an aggregated spatial distribution. Contrary to other crops, where we detected no significant edge effect. Thirty-five infested plants were located on the edge versus six within the field. The number of infested plants on the edge of the field was significantly higher, however the average number of psyllid nymphs on the edge versus the center of the field are not statistically different. Fig 6. Proportion of nymphs collected on the top, middle and bottom of plants over the season. Multiple nymph-based sampling plans were examined using infestation levels of ranging from 23 to 60 percent field infestation; the equivalent of 0.5 to 30 nymphs per plant (Fig 7). Sampling plans based on an infestation of less than 41% of plants infested (5 nymphs per plant) were statistically unacceptable, while little difference was found between the 41% infestation plan and 56% (20 nymphs per plant) infestation plan (Fig. 8). At 41% an average of 11 and maximum of 49 samples would be necessary to make a treatment decision. Decision stop lines are presented in (Fig. 9). When the number of samples with at least one psyllid are above the top line, management action (treatment) is required. When the number of samples is below the lower line, no action is required. When samples fall between lines, further sampling is required. Fig 7. Relationship between the proportion of potato plants infested with one or more B. cockerelli nymphs and the mean number of psyllid nymphs per plan. Fig 8. Operating characteristic curves for potato psyllid binomial sequential sampling plans with action thresholds of 23, 41, & 56% of plants with at least one psyllid nymph. Fig 9. Decision lines for the binomial sequential sampling plan based on a rate of 41% percent infested with at least one potato psyllid nymph. Laboratory and field studies to determine the longevity and mobility of thiamethoxam and imidacloprid in the soil have been completed. Results of this study are being finalized and will be communicated in the next Pepper Commission meeting. We are testing alternative strategies and chemicals for psyllid control such as repellents to disrupt insect behaviors. Successful repellents will be incorporated into an IPM program. Funding from the Pepper Commission has been leveraged by acquiring additional financial support for our pepper research. 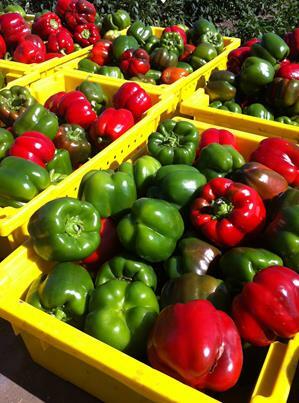 We have received monetary awards from the SCRI funding agency to study and develop pepper IPM program strategies.